Many people want to work the core, but who is exactly sure how to engage the core muscles and what exactly are they? The core or "powerhouse" as we sometimes refer to it in the Pilates world consists of four muscle groups: the diaphragm, the transverse abdominus, the multifidus, and the pelvic floor muscles. When you get it right all four of these groups are working together, harmonizing beautifully as you breathe in and out. So how exactly do they all work together? Check out my YouTube video below to find out how to engage the core. Let's start with the diaphragm, when you inhale it creates a vacuum to send this muscle down into the lower abdomen, as you exhale it shoots back up the elevator shaft in behind the ribcage. Our deep diaphragmatic breathing moves it up and down. The transverse abdominal muscles are those layered deeply in the abdomen that support the spine from the front or anterior aspect. The multifidus are those muscles that wrap in between each vertebra in the back of the spine. So, when we exhale if you imagine deeply zipping up the front and back of the body or making the space there smaller you will engage these two muscle groups. The pelvic floor muscles are those that act like a hammock at the base of the pelvis to help hold all our internal organs up and inside. You can engage these muscles by imagining pulling up a tight pull of pants or bringing the sitz bones at the base of your pelvis up and towards each other. All of these muscle groups should be engage and stabilize the core at the start of an exhale and just a millisecond prior to mobilizing the body for an exercise. 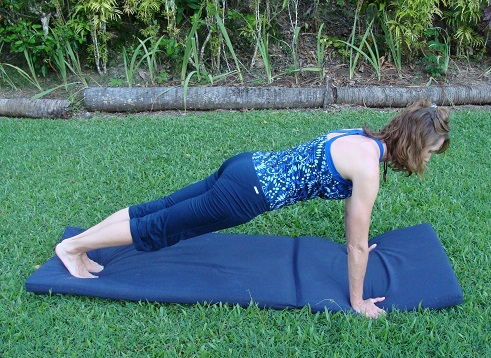 How to engage the core from a Plank position. 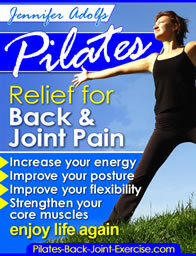 Begin kneeling with your hands under shoulders and knees under hips, inhale to prepare for the movement lengthening one leg out behind you, then exhale as you pull the pelvic floor muscles up and in and close the space from the belly button into the spine, lengthening the second leg out to a full plank position. 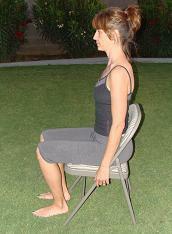 How to engage your core from a sitting position. Sitting tall in a chair, place your hands just under the front or side edge of the chair and flatten your feet on the floor. Inhale to sit tall and feel the diaphragm go down into the lower abdomen, then exhale to pull the chair into you as you lift the sitz bones engaging the pelvic floor muscles and bringing the transverse abdominals (front) and multifidus (back) muscles closer together. Imagine drawing your belly button into the third lumbar vertebra in your back. Find out more about how to engage the core through all of your Pilates mat exercises in my Pilates Ebook here.